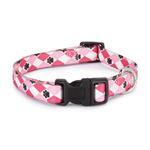 Give your pup a fashionable, durable, and fun look with our Casual Canine Pooch Pattern Dog Collar in Pink Argyle. Bright colors and classic patterns come together for a fabulous look in these Casual Canine Pooch Pattern Dog Collars. The nylon is strong and durable, making these collars not only stylish but practical as well. 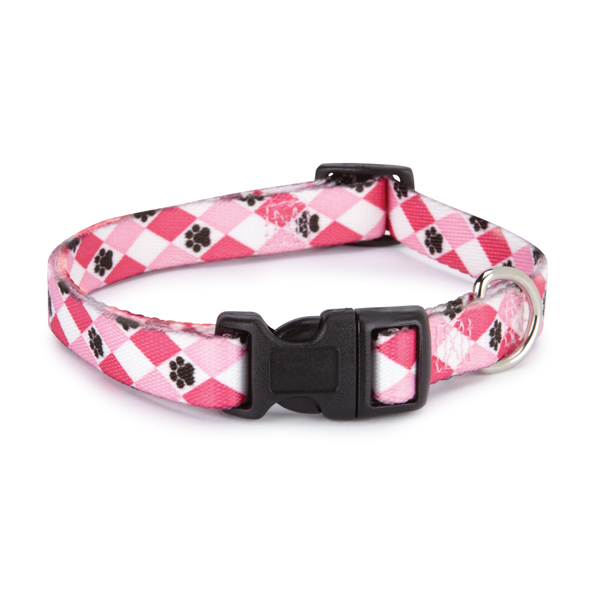 The pretty pink and white argyle with paw print pattern also features a black plastic buckle and nickel-plated D-ring. Matching leashes and accessories sold separately. Got this to match the blue and green one that my other dog has! Love it! Posted On 11/29/16 by Cecelia f from Venice, FL Yes, Cecelia f recommends this product! It's a nice collar. Good fitting and soft. It looks cute on her because the colors stand out because she is light. I do like this collar it fits well. I would recommend buying it. Posted On 03/01/16 by Michelle W from cornelius, NC Yes, Michelle W recommends this product! Posted On 11/01/15 by Lisa from , Yes, Lisa recommends this product! The colors may appear a bit brighter in person, than in the photo. However, the colors are still nice, and the pattern is cute. Posted On 06/22/15 by Lace T from , Yes, Lace T recommends this product! The collar is adorable. It fits well. Posted On 02/05/15 by julie s from dunedin, FL Yes, julie s recommends this product! It looks great against my tan Chihuahuas coat. Posted On 12/14/14 by bonnie p from burnsville, NC Yes, bonnie p recommends this product! Posted On 11/20/14 by michelle h from Sacramento, NM Yes, michelle h recommends this product! This is a very well made collar and the latch is good and strong. Posted On 10/22/14 by Jillian C from Lebanon, KY Yes, Jillian C recommends this product! Posted On 10/07/14 by Angie H from Wheat Ridge, CO Yes, Angie H recommends this product! Very nice collar, easy to get on and off. Great colors!